There are 5 days left in September. Whaaaaat? The garden is winding down. 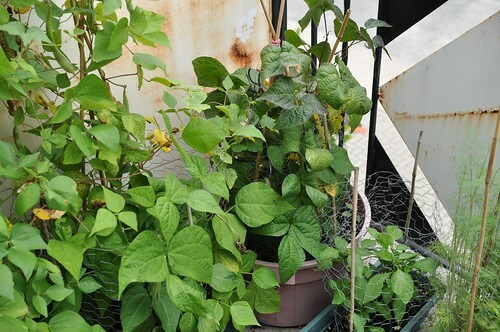 There’s still some greenery, and I need to harvest the herbs. I think the dill went to seed though. 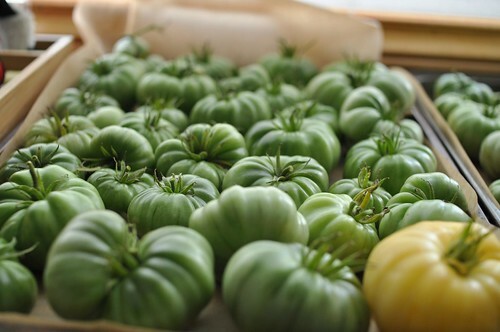 The tomato plants aren’t looking very good so we harvested all the green tomatoes. 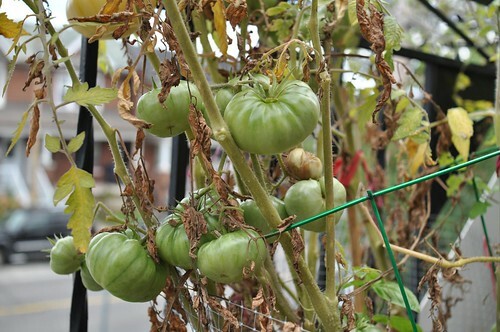 Some will ripen, some will be pickles, some will be fried. There are a lot! I’m super close to finishing the hand quilting on my giant star – that’s the bottom edge right there! 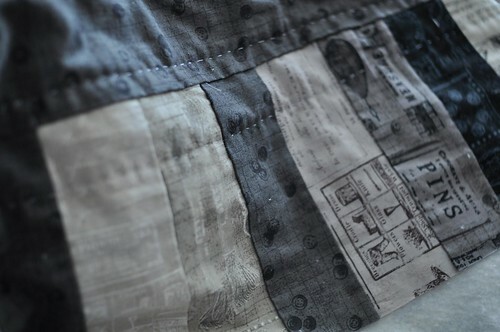 I’m still planning to put in just a few long vertical quilting lines, so it’s not quite done yet. What colour binding shall I do? The back is a dark blue-grey chambray, so I was thinking maybe a navy binding. Or purple. Or red. I’m open to suggestions! 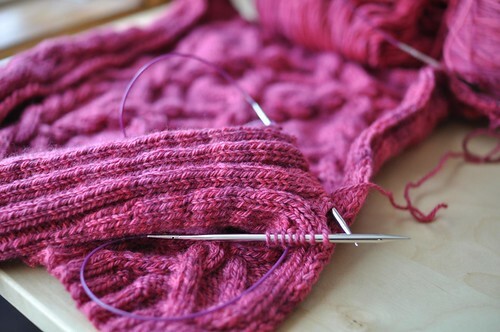 I started a new worsted weight sweater with this yummy pink organic merino from Phoe. It’s Fleece Artist, so it’s kinda funny that it went from Nova Scotia to England and then back here to Ontario. I’ve ripped this sleeve twice already, so I’m hoping the third time’s the charm. It might even be a Rhinebeck sweater. Speaking of Rhinebeck, have you seen Ysolda’s The Rhinebeck Sweater book? It’s full of people and sweaters I love, in a setting I adore! I really missed attending last year, and I’m really excited about this one. 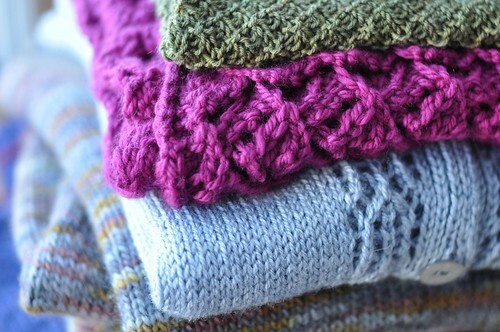 In case my pink Rhinebeck sweater doesn’t work out, I do have a pile of other new sweaters to wear – my next collection! It’s a small one, with 3 sweaters and 2 accessories. I’m really happy with how they all came out, and the yarns from Lorna’s Laces are heavenly! 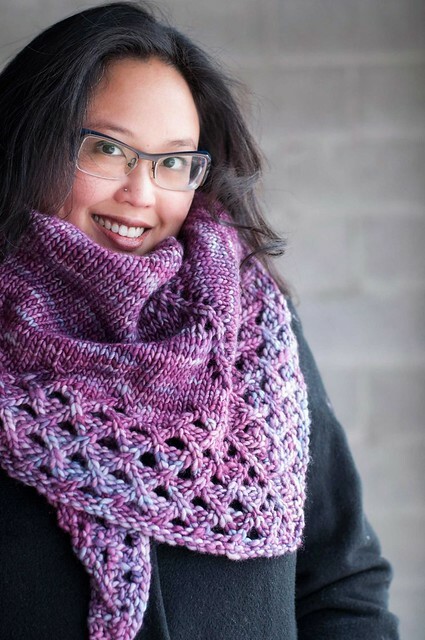 The patterns should be available in October – before Rhinebeck. Love this post – everything in it is so cozy and fall! You got me! I am totally intrigued. Can’t wait to see the collection (especially that pale blue one). Love that pink! (And I almost never say that.) :) Phoe yarn boxes are the best.